Franco fancied stopping in Bora Bora, he’d heard it is very beautiful. We joked that we would sail into the lagoon, drop the anchor, take the photo and sail away. In the end, that was pretty much what we did. 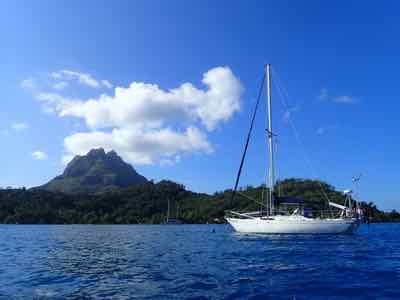 We sailed into the lagoon, picked up a mooring at the Bora Bora Yacht Club. It is a restaurant that provides a minimum of services to yachts, for a fee. Its main clientele are honey mooning couples and the yachts at anchor are necessary to provide the backdrop. The next morning we took the photo and kayaked around the island. I’d read about the ‘manta ray ballet’ a snorkelling spot where manta rays swim. It was on the other side of the island and the kayaks were the best way to get there. The book I’d read emphasised the need to be quiet and still, otherwise the manta rays would stay away. Franco told me not to get my hopes up. He asked how we would know we were in the right spot. “They’ll be tour boats at anchor and snorkelers in the water,” I told him. When we arrived, there was no doubt we were in the right place: six boats, fifty swimmers, four jet skis screaming around and other passing traffic. It wasn’t quite what I’d had in mind. 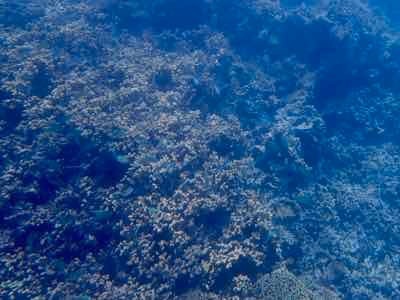 One thing was certain, the manta rays were somewhere else. 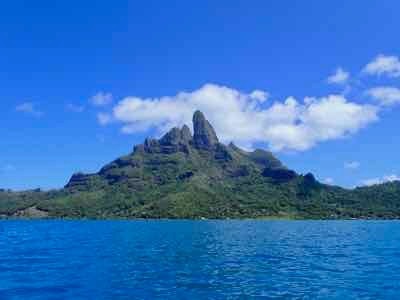 The island of Bora Bora is beautiful, the mountains Otemanu and Pahia provide an ever changing spectacle as clouds swirl around their summits. 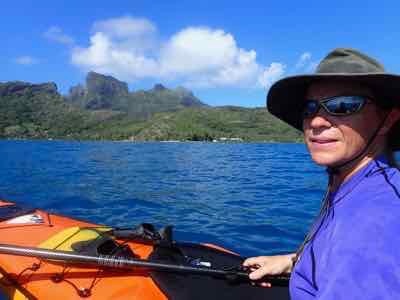 We enjoyed paddling around the island and snorkelling in the warm water (though Fakarava is going to be a hard act to follow), but we’d seen enough of Bora Bora so got stuck into Pesda Press work. Before arriving, if I’d been asked to give three words that would describe Bora Bora, I would have said ‘exclusive’, ‘luxurious’ and ‘romantic’. That is the idyl the tourist brochures try to sell. The reality is that this is the first place in French Polynesia that feels like a cheap and nasty mass tourism resort (though cheap, it isn’t). We aren’t the only ones to think so either, over the VHF radio, we heard a French yachtie compare it to Benidorm, in Spain. To give you an idea, when resort guests come to the Bora Bora Yacht Club for a delicious romantic dinner, they have a two hour slot. There isn’t time to linger watching the moon rise over the lagoon and the yachts gently swaying in the breeze. Their shuttle back to the resort is waiting. And when they get back to their bungalow on stilts and decide to go for a midnight skinny dip in the warm water of the lagoon, more than likely their one hundred and fifty neighbours will be watching. If they skip the dip and dive straight into bed instead, within minutes the neighbours will be banging on the wall to demand they keep the noise level down, woven palm leaf walls don’t afford much privacy. Desperate to make the most of it, the next morning they book a picnic tour to a desert island through the hotel desk, and get charged a 40% markup. By the time they get to the island, it is far from deserted, as at least a dozen other tours have already set up camp. 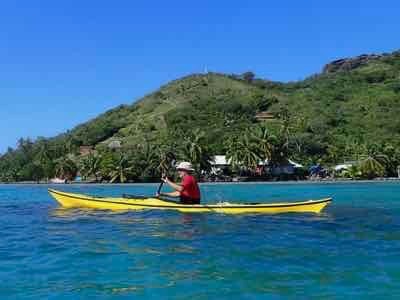 As this is our last port of call in French Polynesia, we need to sign out with the ‘gendarmes’ so we made one excursion ashore to the small town Vaitape. People saying ‘hello’ was the exception rather than the norm, more locals spoke French to each other than Tahitian and the supermarket felt a bit run down. The owner of the yacht club, a very pleasant guy, had seemed a little paranoid about theft. “You must park your dinghy here on the pontoon, my staff are always keeping watch. Don’t leave it on the beach.” He’d told us on the first night. As we were filling in the numerous departure forms at the police station, a Frenchman came in to report the theft of his dinghy. He’d somehow got the paddle stuck so focused on freeing it. By the time he turned around, his dinghy had vanished. He was a little embarrassed. I get a sense of inequality here we didn’t feel elsewhere in French Polynesia. There are jobs in the hotels but work in the tourism industry is generally poorly paid. The resorts are mostly owned by large hotel chains so the money bleeds back to the hotel headquarters or to some low tax fiscal paradise. 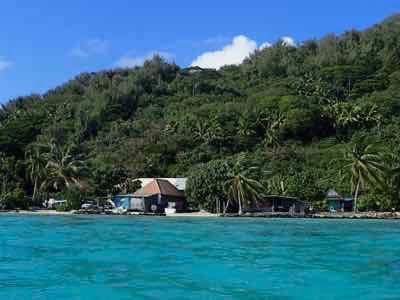 In Huahine, there were few resorts and the tourism infrastructure was locally owned. 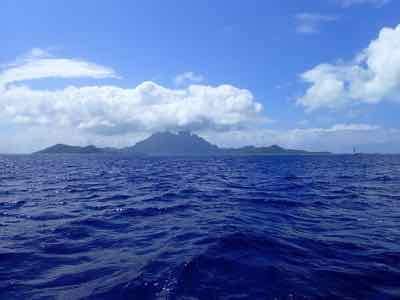 Most Polynesians we met were remarkably uninterested in money or accumulating wealth. They had what they needed, and didn’t crave more. 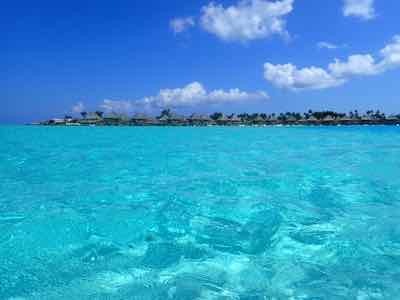 Maybe in Bora Bora the situation is different. 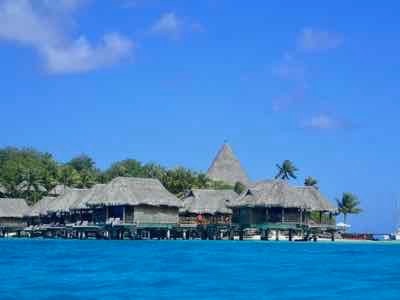 Bora Bora was the first island to be heavily developed for tourism. The others looked on ... and decided to go a different way.